Jenna and I went to Ottawa for a weekend in the middle of October, finally–neither of us had yet been there, even after several years in Canada, and considering that Ottawa isn’t really that far away from Niagara. Jenna wanted to go to a conference on global health so it was a good excuse to go. We had tremendous luck with the weather and with the choice of weekend; fall colours were at peak. Well, I was lucky: only the Sunday was nice; the Saturday was gray, dull, cold, wet and foggy, and that was the only day Jenna had for sightseeing. 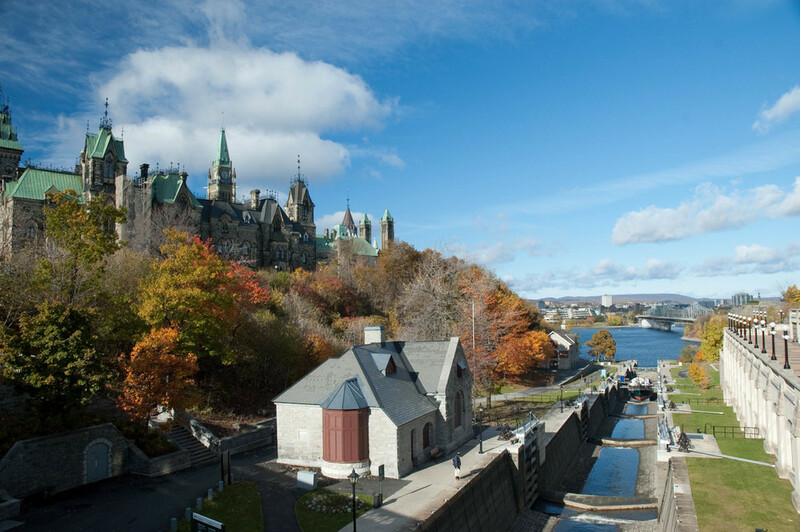 Ottawa is a really nice city, with its location of the city over the Ottawa River and with the Rideau Canal running through it. In the picture, you can see the Rideau Canal going through a number of locks down to the Ottawa River. Parliament is on the bluff to the left, overlooking the river and the canal (a spectacular location for a spectacular set of buildings, if you ask me). 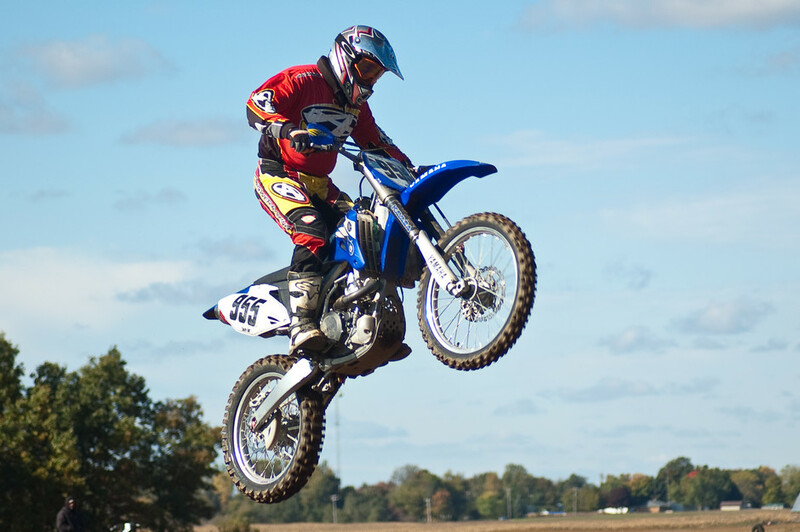 We went to Kalamazoo for Canadian Thanksgiving (as usual), and Ray, Jenna’s dad, had press passes to a motocross event as a part of a class in sports photography he is taking. So I got to go see and take pictures of something I would otherwise never have seen. This is the second of two posts. This is the first time I’ve actually the first time I’ve successfully panned a subject, which means moving the camera with the subject in order to create a blurred background (with motion streaks), which captures the effect of movement. These motorcyclists are definitively not standing still, as a high shutter speed might make you think. The shutter speed here was 1/160th of a second. Lower shutter speeds are possible but it’s harder to make the subject sharp. 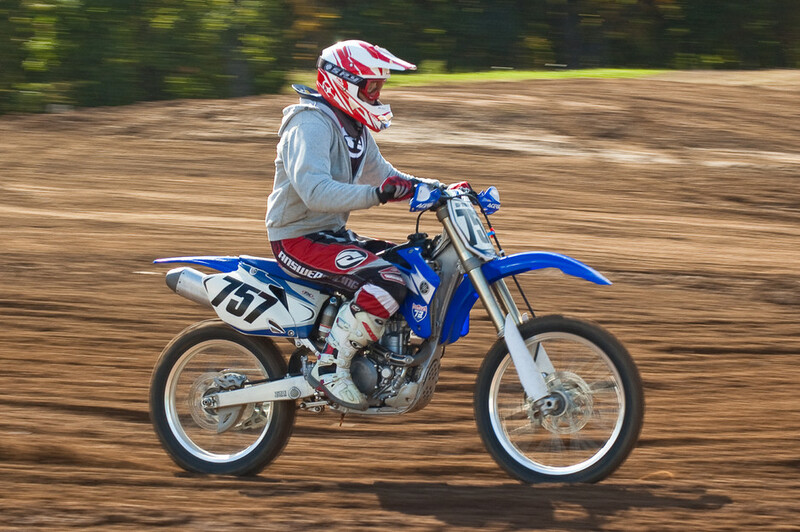 We went to Kalamazoo for Canadian Thanksgiving (as usual), and Ray, Jenna’s dad, had press passes to a motocross event as a part of a class in sports photography he is taking. So I got to go see and take pictures of something I would otherwise never have seen. I’m not normally a fan of motor sports — I have too many other things to do and be concerned about. And it’s not the most sustainable sport out there, to put it mildly, but there’s nothing I can do about that. Plus, seeing people do crazy stunts on motorcycles is undeniably cool… The acrobatics and level of physical control human beings are capable of never ceases to amaze me. And it makes great pictures and great fun taking them. I don’t really have the equipment for this kind of photography, though. Sports photography is typically very fast-paced, and my zoom lens is anything but fast. It’s a bargain basement Nikon 300mm f/4-5.6. Under bright conditions (like the day I took this picture) it keeps up — barely. But a faster lens — say a fixed f/2.8 — is sure to give you sharper pictures even under conditions where my f/4-5.6 can cope. That said, I’m very happy with the results of my 300mm, which far exceeded expectations. Maybe it’s not all in the equipment. My biggest gripe is probably the horribly slow auto-focus, driven by a motor in the camera body. But considering the $200 I paid for it, however, it’s doing very well. 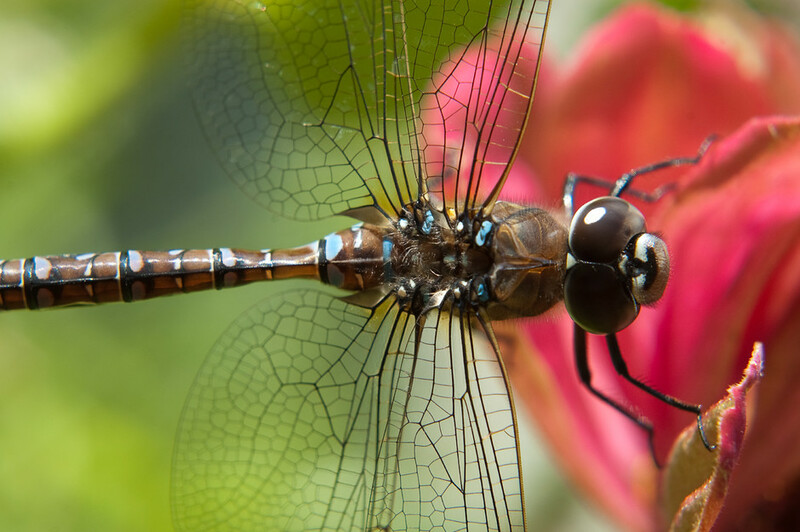 I finally got to take a close-up of a dragonfly. A bunch of them were swarming in the garden all evening, and one obliged to sit on a flower for a while so I could take pictures. I used the 50mm with one +4 close-up filter (magnification filter) and one +2 filter. I was extremely pleased by the outcome. This picture is actually true macro, meaning the dragonfly depicted is greater than 1:1. Manitoba has a fair amount of Icelandic influence, owing to a bunch of settlers that came over in the 19th century and founded a town called Gimli. 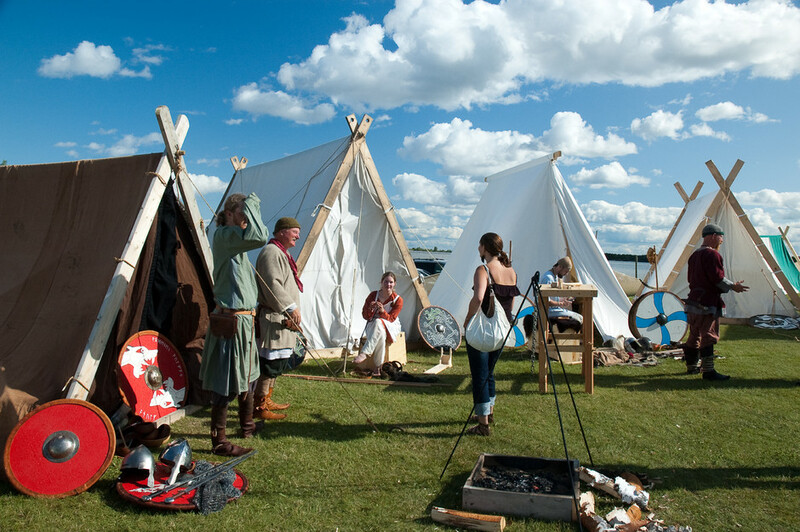 Naturally, Gimli has to have an Icelandic festival every year, the highlight of which is a viking camp put together by various “living history” groups.I went there with a couple of colleagues form work; it was really cool, very well done. Sadly, we missed the highlight — the fighting demos. But we did get to try archery, that was fun. 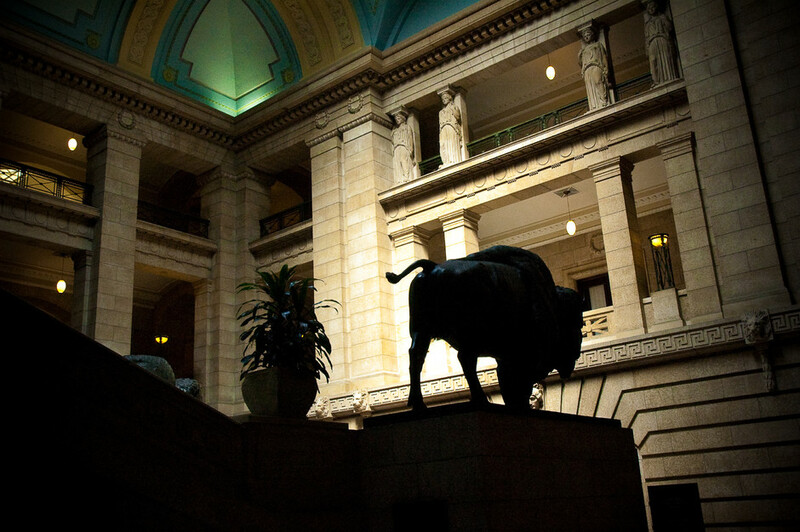 Inside the atrium of the Manitoba Leglislature, taken from behind the grand staircase and the iconic bison, mascot of Manitoba. 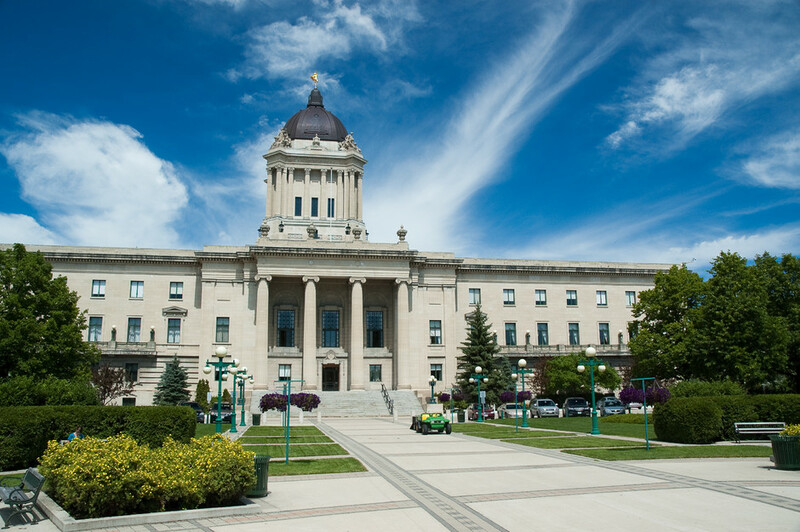 The Manitoba Legislature, home of the provincial parliament, is a pretty impressive building, and a monument to the ambitions this city had in the early days of the 2oth cewntury. Winnipeggers owe a lot to the people of that day, whose entrepreneurship ensured that the city now has a lot of historical buildings with lots of character, and not just urban sprawl and blight. We got a free tour of the building, but strangely enough, among all the trivia our tourguide had to offer (fossils in the walls — that’s pretty cool), she didn’t mention it was heavily influenced by freemasons who may have intended it to be a replica of King Solomon’s temple… The CBC produced a very interesting documentary about this, see it on youtube (quality isn’t very good). 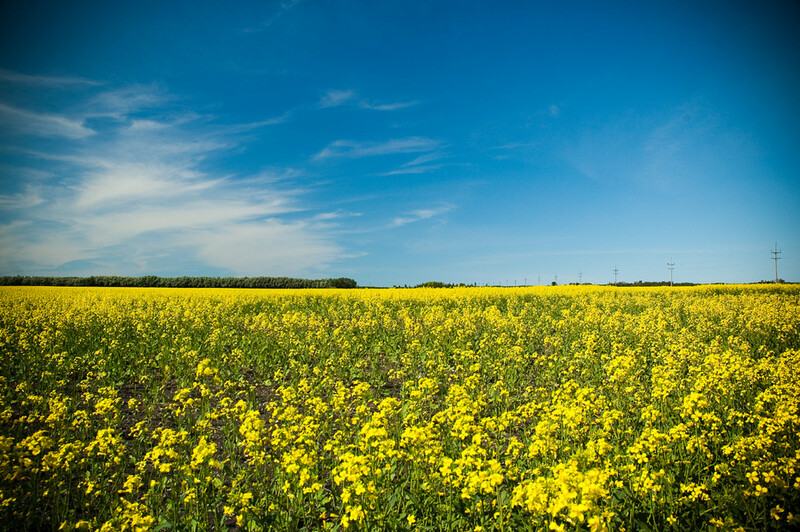 I had to have a memory also of the incredible flatness and vastness of the prairie. Of course, there was fairly much vegetation in the corner of it that we saw. And we truly only saw a corner! The prairie stretchess thousands of kilometres to the south, all the way to Texas if I’m not mistaken more or less without stop, through the Dakotas, Iowa, Nebraska, Kansas and Oklahoma. In short, tornado alley. But it was a pretty corner we saw, with all the rapeseed fields. Jenna took this picture of me :P I have to admit it’s a good representation of me–always with a camera! 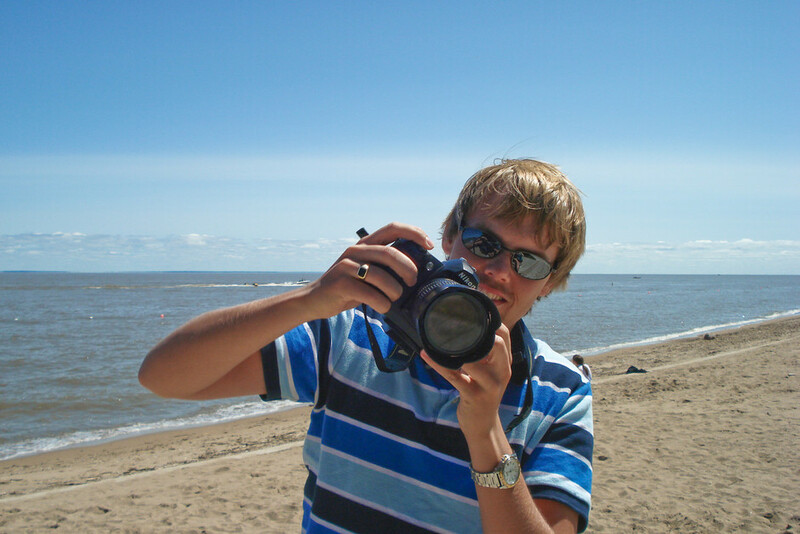 The picture was taken at Winnipeg Beach–not in Winnipeg–with Lake Winnipeg in the background. I went out to take pictures of the sunset, and finally try out my Cokin graduated neutral density filters. I bought them back in April, and I still hadn’t had an opportunity to use them. I found out that I just had to make myself an opportunity, so I went out. 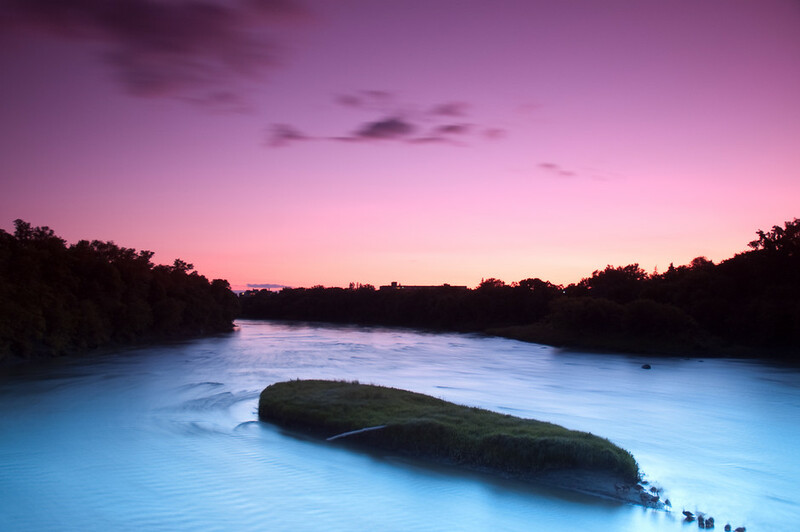 I took this picture of the Assiniboine River around 10:30PM, long after the sun had set. The picture was taken with a 10 second shutter speed, but with max aperture. To control the light I used all three Cokin filters, which darkened the sky while letting through all the reflection from the river. Hence the camera picked up lots of red wavelength from the sky, and the the water looks like a vibrant blue veil. I’ve not done any post-processing at all (let me know if you think it needs it!). Notice the family of geese in the lower right corner!